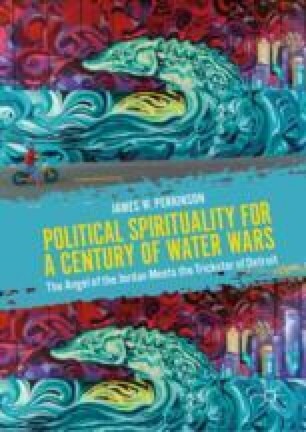 Chapter 2 centers the book’s overall concern for water politics in contemporary Detroit, offering a brief resume of the neocolonial history of the Strait, including the last sixty years of white flight, but focused especially on a new modality of white supremacy understood in terms of Michel Foucault’s “Biopolitics,” culminating in the state-imposed regime of emergency management since 2013—embodying finance capital evisceration of city assets and democratic process in the name of an austerity politics and a racialized renovation of public water provision. Countering this neo-liberal experiment in privatization, large-scale foreclosure, and takeover of water-infrastructure—recently re-deployed from the Global South in stressed Northern cities like Detroit and Flint—is the ferocious creativity of African American-led grassroots coalitions seeking a different “world possibility” that gives the book its particular leitmotif. Barry-Jester, Anna Maria. 2016. What Went Wrong in Flint. FiveThirtyEight, January 26. Viewed December 26, 2018, https://fivethirtyeight.com/features/what-went-wrong-in-flint-water-crisis-michigan/. Elgion, John. 2016. A Question of Environmental Racism in Flint, New York Times, January 21, http://www.nytimes.com/2016/01/22/us/a-question-of-environmental-racism-in-flint.html. Feeley, Diane. 2013. Which Way Out for Detroit? Solidarity Newsletter, November/December. Viewed December 25, 2018, https://solidarity-us.org/atc/167/p4027/. ———. 2015. A Hurricane Without Water: Detroit’s Foreclosure Disaster, http://www.internationalviewpoint.org/spip.php?article4078. International Decade for Action. 2014. ‘Water For Life’ 2005–2015, November 24. Viewed December 26, 2018, http://www.un.org/waterforlifedecade/scarcity.shtml. Joyce, Frank. 2013. The Real Story Behind the Decline of Detroit … And Yes, Great Things Are Happening There Too, Alternet, September 2, http://www.alternet.org. Kurth, Joel. 2016. Detroit Hits Residents on Water Shutoffs as Businesses Slide, Detroit News (April 1). Viewed December 25, 2018, https://www.detroitnews.com/story/news/local/detroit-city/2016/03/31/detroit-water-shutoffs/82497496/. Maynard, Mark. 2014. Everything You Ever Wanted to Know About the Emergency Manager Takeover of Michigan, and How We Allowed It to Happen, MarkMaynard.Com, July 29. Viewed December 26, 2018, http://markmaynard.com/2014/07/everything-you-ever-wanted-to-know-about-the-emergency-manager-takeover-of-michigan-and-how-we-allowed-it-to-happen/. Mock, Brentin. 2016. Resolving the Racism at the Heart of Flint’s Water Crisis, CityLab, March 30. Viewed December 26, 2018, https://www.citylab.com/equity/2016/03/how-to-resolve-the-racism-at-the-heart-of-flints-water-crisis/475737/. Neavling, Steve. 2016. Gov. Snyder Lied; Flint Water Switch as Not About Saving Money, Records Show, Motor City Muckraker, http://motorcitymuckraker.com/2016/01/23/gov-snyder-lied-flint-water-switch-was-not-about-money-records-show/. Pérez-Peña, Richard. 2016. Michigan Governor Says Race Had No Role in Flint Water, New York Times, http://www.nytimes.com/2016/01/23/us/flint-water-crisis-michigan-governor-rick-snyder.html?_r=0. Rabinow, Paul and Nikolas Rose. 2003. Thoughts on the Concept of Biopower Today. ResearchGate, January. Viewed November 1, 2018, https://www.researchgate.net/publication/228606732_Thoughts_on_a_Concept_of_Biopower_Today. Rankin, Kenrya. 2016. Michigan Governor Says Race Not a Factor in Flint Water Crisis, EPA Official Resigns, Color Lines, January 22, https://www.colorlines.com/articles/michigan-governor-says-race-not-factor-flint-water-crisis-epa-official-resigns. Sanburn, Josh. 2014. All the Ways Darren Wilson Described Being Afraid of Michael Brown, Time, November 25. Viewed December 26, 2018, http://time.com/3605346/darren-wilsonmichael-brown-demon/. Turbeville, Wallace. 2013. The Detroit Bankruptcy, Demos: An Equal Say and an Equal Chance for All, November 20, http://www.demos.org/publication/detroit-bankruptcy.